The third Leyte was laid down as Crown Point (CV-32) by Newport NewsShipbuilding & Dry Dock Co., Newport News, Va., 21 February 1944; renamedLeyte 8 May 1945; launched 23 August 1945 sponsored by Mrs. James M. Mead,and commissioned 11 April 1946, Capt. Henry F. MacComsey in command. Leyte joined Wisconsin (BB-64) on a good will cruise down the western seaboard of South America in the fall of 1946 before returning to the Caribbean18 November to resume shakedown operations. The following 3 years were spent in numerous fleet exercises in the Atlantic and Caribbean; training naval Reservists; and four deployments in the Mediterranean: April to June 1947,July to November 1947, September 1949 to January 1950, and May to August1950. The latter included a demonstration of airpower over Beirut, Lebanon,13 August supporting the Middle East against Communist pressure. Leyte returnedto Norfolk 24 August and after 2 weeks of preparation departed 6 Septemberto join TF 77 in the Far East to support United Nations Forces in Korea. Leyte arrived Sasebo, Japan, 8 October 1950 and made final preparationsfor combat operations. From 9 October through 19 January 1951 the ship andher aircraft spent 92 days at .sea and flew 3.933 sorties against the NorthKorean aggressors. Her pilots accumulated 11,000 hours in the air whileinflicting massive damage upon enemy positions. supplies. transportation,and communications. Leyte returned to Norfolk for overhaul 25 February. 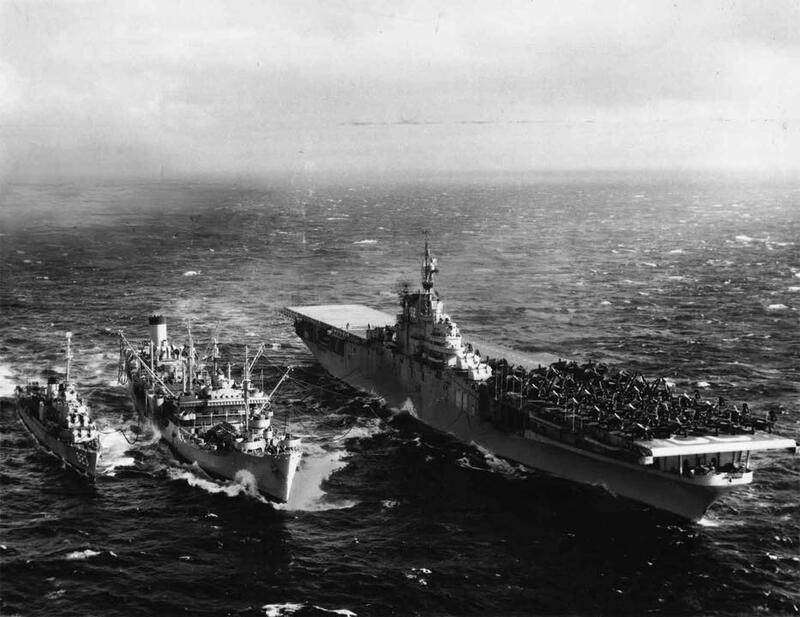 After fleet training exercises in the Caribbean terminated 21 August,the carrier departed for her fifth tour of duty with the 6th Fleet 3 September.She returned to Norfolk 21 December for operations out of Hampton Roads,and again steamed for the Mediterranean 29 August 1952. Reclassified CVA- 32 on 1 October 1952, she returned to Boston 16 February 1953 for deactivation.On 8 August however, she was ordered to be retained in the active fleet,and, redesignated CVS - 2 on the same day, work was begun converting herto an ASW support carrier. On 16 October 1953, at 1515, while still under conversion to an antisubmarinecarrier, Leyte suffered an explosion in her port catapult machinery room.Within minutes naval base and city fire trucks were on the scene. Aftera hard and gallant fight the fire was extinguished at 1957. As a resultof the fire, 37 men died and 28 were injured. Conversion completed 4 January 1954, Leyte departed Boston for QuonsetPoint, R.I., as flagship of CarDiv 18. She remained there for the next 5years conducting ASW tactical operations along the eastern seaboard andin the Caribbean. Leyte departed Quanset Point in January 1959 for the New York Navy Yardwhere she commenced preinactivation overhaul. She was redesignated AVT-10and decommissioned both on 15 May 1959, and was assigned to the Philadelphiagroup of the Atlantic Reserve Fleet with a berth in New York, where sheremains into 1969. Leyte received two battle stars for Korean service.